I’m so thrilled to have been selected to share this news with you. Because when you combine three of my favorite things – kids, shopping and creativity – it’s pretty exciting. GapKids is hosting a series of events for kids to unleash their inner artist. The special art projects are designed by Merrilee Liddiard of Mer Mag. Merrilee is an illustrator, painter, designer, crafter, seamstress and mother. Mer Mag, is a journal of her creative endeavors with her kids. Here are a few samples of projects from her blog. The projects in the GapKids Shine On Saturdays event, which include a journal and animal character, were inspired by the GapKids and babyGap fall collection. The collection includes Jewel Box Skinnies for girls. And Action Stretch Denim for boys. 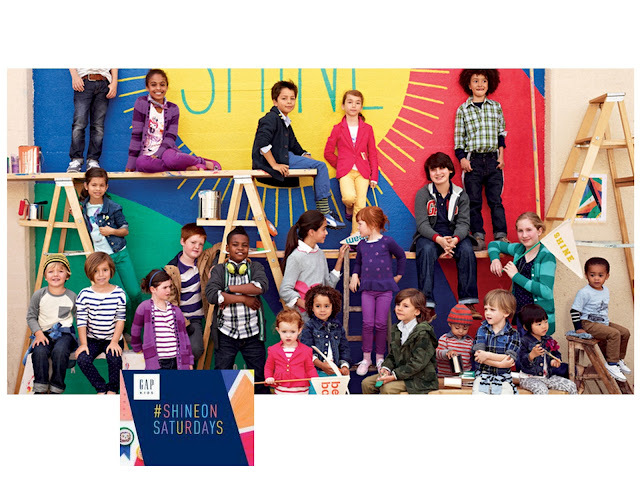 This month, select GapKids stores will be hosting the Shine On Saturdays events. Aw, that looks like such a fun event!! I think they have one near me that i'll have to go take my kids to! Very colorful and would be a lot of fun for kids-- not to mention adorable clothes! Looks like so much fun! Plus who doesn't love all those cute clothes! This is great! I am impressed that GAP is getting involved in this way. Thanks for sharing. This looks like so much fun ~ my little guy would absolutely LOVE this! Looks fun - love crafts and Gap! I hope to be going to the one in the SF Bay Area next weekend!